Here’s my sixth blog post about virtual reality. If you’ve read the previous five, you’ve followed my self-education about this rapidly developing technology. Some of you are doubtless far ahead of me, others might want to go back to my previous posts to trace the path I’ve been on. The more I learn, the more I am convinced we need to figure out how to master this technology for the gospel. This post directs you to some places to learn more about AR/VR, and what others are doing with it. If you are interested, check out these spots soon, because things are moving very fast, and what is posted here will be out of date in a few months. One good place to track what is happening in VR is at VRScout. When you subscribe, you get a weekly email containing news of VR applications in all kinds of areas. The following items are from their June 1 newsletter. Following a year of experimenting in a limited number of schools, Google has opened up their educational AR/VR materials to a wider audience. Google VR tours take viewers to anywhere in the world Google Maps has been, and students can create their own tours. Several hundred Google AR tours are already available, ranging from science (look inside an atom) through history (experience WWI trench warfare) to the arts (visit the impressionists), and beyond. Attend sporting events and concerts from home. You can choose your stadium seat, and watch a real game (or concert) as if you were there. 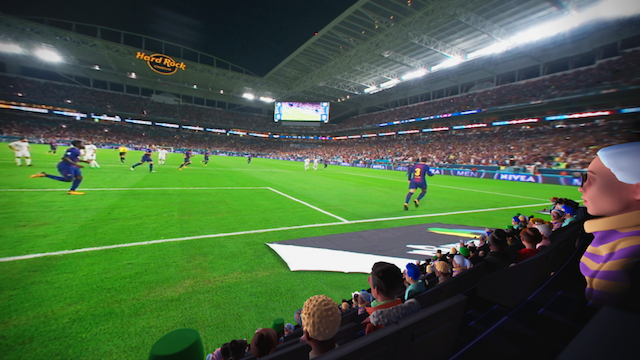 Beside your seat choice option, you can also choose whether or not you want to visit with your neighbor (there will be other virtual spectators sitting next to you), or turn them off – something you sometimes wish you could do at a real stadium but can’t. Image from VRChurch Facebook page. About that baptism. It’s reported in the VRScout. DJ Soto is about the most “techy” clergyman I know, with a strong background in the industry. 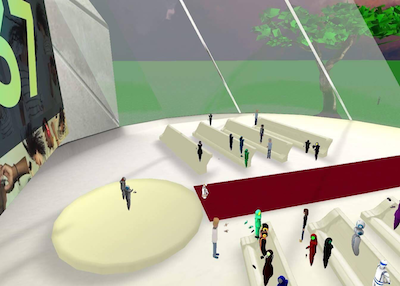 For several years he has been experimenting with a virtual worship service, and since May of this year his team’s goal is to replicate all the functions of a real congregation in a virtual church space on AltSpaceVR. His service is conducted every Sunday evening at 6:30 p.m. CDT, consisting of a half-hour of non-liturgical worship (music, prayer, and a sermon), followed by a half-hour of Q&A and virtual fellowship. My first visit, just tonight, was impressive enough, though I didn’t get the full VR experience since I was there only in 2-D on my computer screen. The music was fun gospel-rock. The sermon was on the Prodigal Son, strong on the love of God for “train-wreck” people (DJ seemed to sense many such were in his audience), not so strong on the atonement of Christ on which that love is based. I arrived a few minutes late and my avatar was shunted into an “overflow room” since more than 150 people were there [!] and the main church’s bandwidth couldn’t handle that many in VR. After the sermon, people (ones I recall came from California, Texas, Georgia, Belgium) hung around and you could greet each other and visit. The weekly worship experience anchors numerous chat-room channels (such as “faith and science”) that continue throughout the week. * It was an avatar held under water. Image from VRChurch Facebook page. 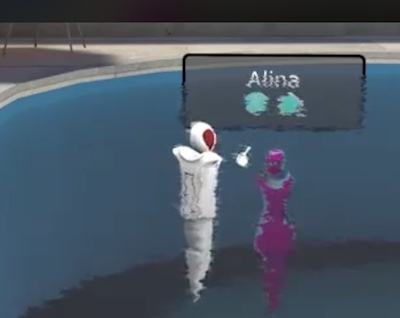 A few weeks ago DJ conducted his first virtual baptism by immersion in a beautiful virtual pool. There are several videos about it on their Facebook page. In his view – he is an Evangelical – baptism is merely a symbolic event reflecting the experience of a major life-change. Accordingly, he enhanced the event for the baptized person by keeping her* underwater for a full ten minutes so she could fully enjoy the experience – an advantage not available in reality. DJ admits that, even in his Evangelical circles, the practice of virtual baptism is controversial. Among us, for whom baptism is a sacrament, not just symbolic but bringing the forgiveness of sins, and to be administered strictly according to our Lord’s instruction (using real water), a virtual baptism would be more than problematic. Recently I attended (online, of course, though not in VR) a conference pursuing how VR could be used in service of gospel outreach, hosted by Clyde Tabor of the Visual Story Network (VSN), an interdenominational but largely Evangelical organization from which I have learned a lot. They have an extensive website, as well as a specialized “Mission AR/VR” group on Facebook. A couple dozen participants with a wide variety of expertise attended, all deeply interested and committed to pursuing this technology in service to the Lord. The entire hour-long session is archived and available online, and while it moves slowly in some spots, I think there are enough exciting insights and revelations to make it worth your time. Experiment. Get a headset [the new Oculus Go ($199) is getting good reviews] experience the technology, and just try things. I might just do that. You have to be in full VR to appreciate the technology’s power. Build relationships. We have long acknowledged that (despite the impressiveness of technology) the most effective evangelism is done in one-on-one conversations, and we have consistently maintained that the best use of technology is to make those conversations easier – for example, by sharing a short Bible video on your phone, and then discussing it. Interestingly, virtual reality might be the most promising technology to support person-to-person conversation. In contrast with broadcasting, movies, and videos, all of which address mass audiences, virtual reality lets you meet some lone individual person (who might be anywhere in the world) and hold a conversation one-on-one. This kind of interaction is key to building a relationship across which the gospel can flow. With anyone, anywhere. Yes, this one-on-one can be with someone on any continent in the world. Of course, both you and they will need to be VR capable, which means this kind of outreach would be focused on the more affluent. Our synodical experience with world missions has been just the opposite; we have typically started by reaching out to the poor. We should continue to do so. But VR might be a tool especially for reaching the famous “nones” right here in the U.S. Welcome the “experience age.” Already two years ago TechCrunch claimed “the information age is over; welcome to the experience age.” If this is true, we have some figuring-out to do. The strength of VR is indeed to provide more vivid, stunning experiences. It’s not hard to imagine how that could include more vivid, stunning religious experiences. We have no objection to life-changing religious experiences – St. Paul had an important one. But our faith is not based on our experiences, but on the Word and promises of God in Scripture. In this regard, VR’s strength might work more in harmony with the Evangelical’s experience-based theology than ours. If our use of VR is to produce religious experiences, we will have to do so very carefully, accompanied by clear teaching about the ground of our faith. Make disciples. To us who revere our Lord’s Great Commission in Matthew 28, “making disciples” of all nations is closely connected to “teaching them to observe all the things” the Lord has told us in Scripture. While the Evangelicals might tend to focus more on creating VR experiences, we Lutherans should perhaps focus more on how to use VR technology for teaching. Those are DJ’s five principles, and some of the thoughts they prompted in me. What are yours? 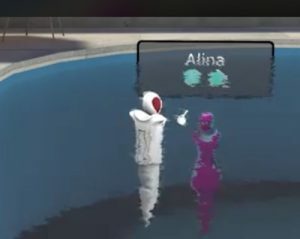 Recently Microsoft invested in VR by purchasing AltspaceVR, the place where anyone can meet anybody, and where DJ’s virtual church gathers. As for Facebook, Mark Zuckerberg bought Oculus, a leading headset designer, and declared his intention to invest one billion dollars (with a B) in VR, his goal to engage one billion (another B) virtual reality users. Google and Alibaba reportedly invested as much as $4.5 Billion in Magic Leap, an AR startup. Clearly the big movers think VR/AR is worth attention. I think we should too.